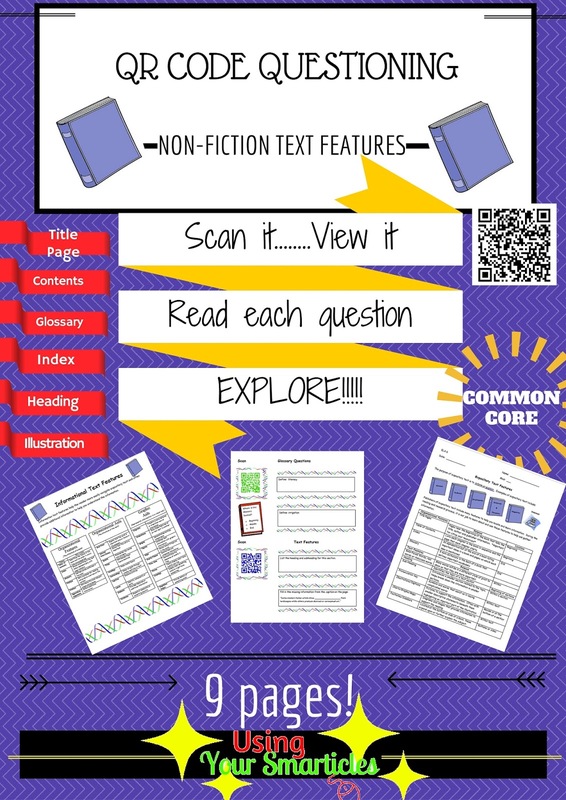 QR Code Activities for YOUR Classroom! 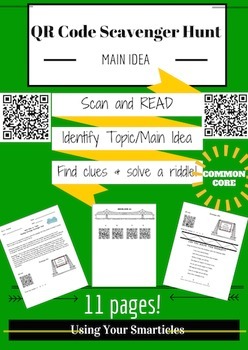 Below are some QR Code Scavenger Hunts that I have designed to be fully printable and ready to use. 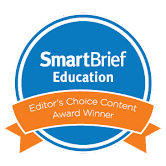 As long as you have a wi-fi enabled smart device that can scan, you can use these ‘hunts’ to support student literacy skills. 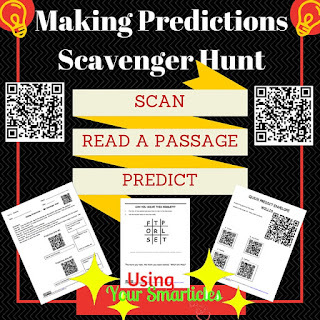 This Scavenger Hunt allows students to practice utilizing context clues while having fun! 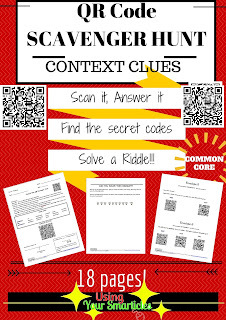 Students 'scan' a QR code to get their context clue question. 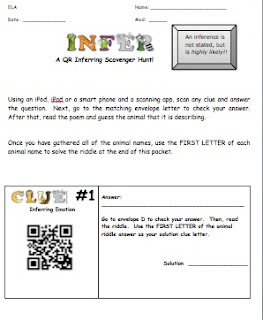 Answering a question will lead them to an envelope which has more context clue questions, QR codes AND clues to a riddle! When all of the riddle clues are gathered, they can solve the riddle. 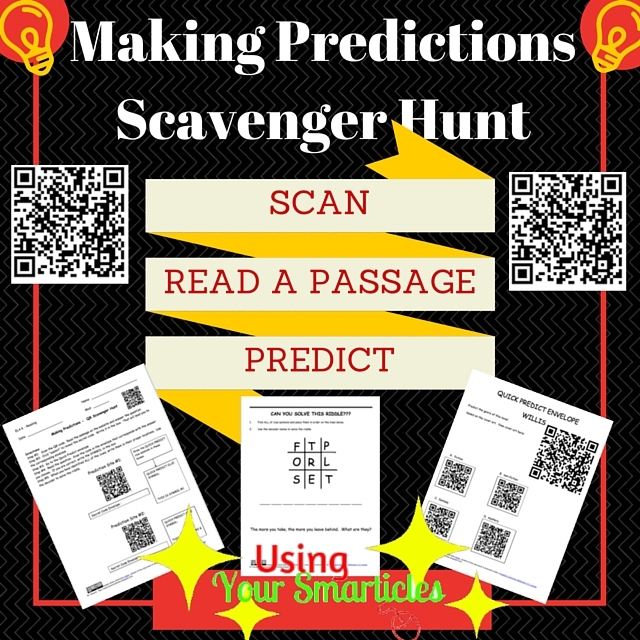 Once students understand the directions to this scavenger hunt they will be cooperative, engaged and learning and you sit back and enjoy! A true 'plug and play' lesson. One of my favorites! 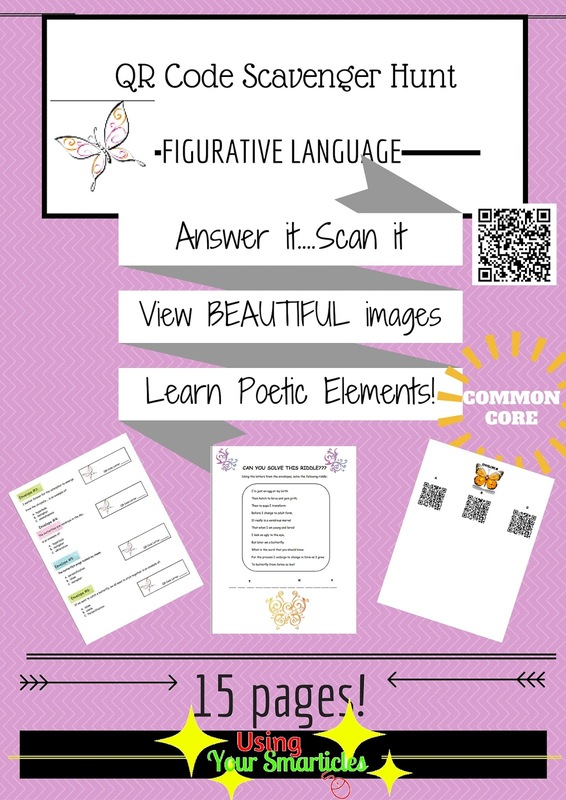 This QR Code Scavenger Hunt aids students in the application of figurative language skills. 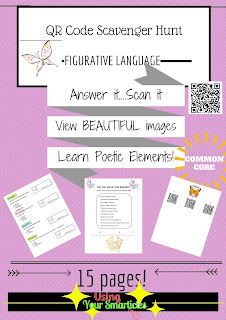 Featuring: onomatopoeia, hyperbole, similes, metaphors and personification, students answer questions and visit stations to scan QR codes for alphabetic clues. The Scavenger Hunt is 'themed' after Kjell B. Sandyed's beautiful butterfly alphabetic images. 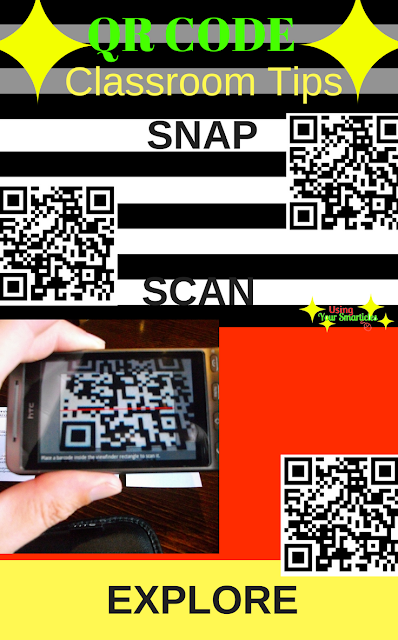 Each QR code leads to a butterfly wing image of a letter. The final challenge is to gather all of the letters to solve a riddle. This scavenger hunt features a five reading passages that students must read and identify the main idea presented by the author. They do this by scanning a QR code and reading the passage. 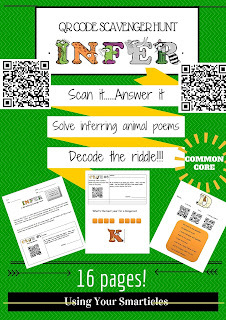 Student then visit a QR code envelope and scan the corresponding code to get a clue letter. Once all clue letters are gathered, they can solve a riddle. The theme of this scavenger hunt is bridges. I intentionally made the TOPIC of each passage the same (bridges) so that students are forced to recognize the different between Main Idea and Topic. 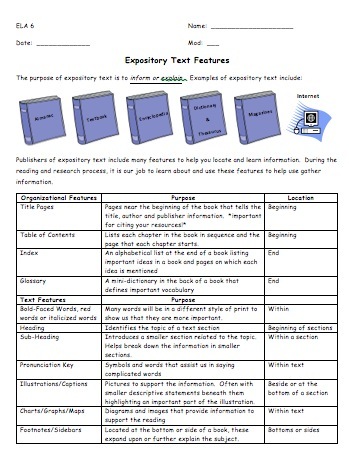 Also included is a handy reference sheet for students to keep in their personal resource materials. This Scavenger Hunt allows students to practice the valuable skill of inferring while having fun! 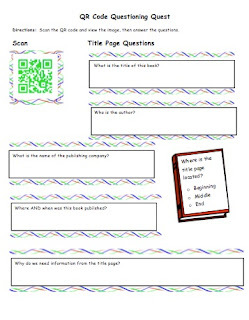 Students 'scan' a QR code to get their statement that they have to make inferences from. Statements include Inferring emotion, inferring story events, inferring character traits, inferring emotion, drawing conclusions, inferring word meaning, inferring needs, inferring tone. Answering a question will lead them to an envelope which has an animal riddle (more critical thinking!) 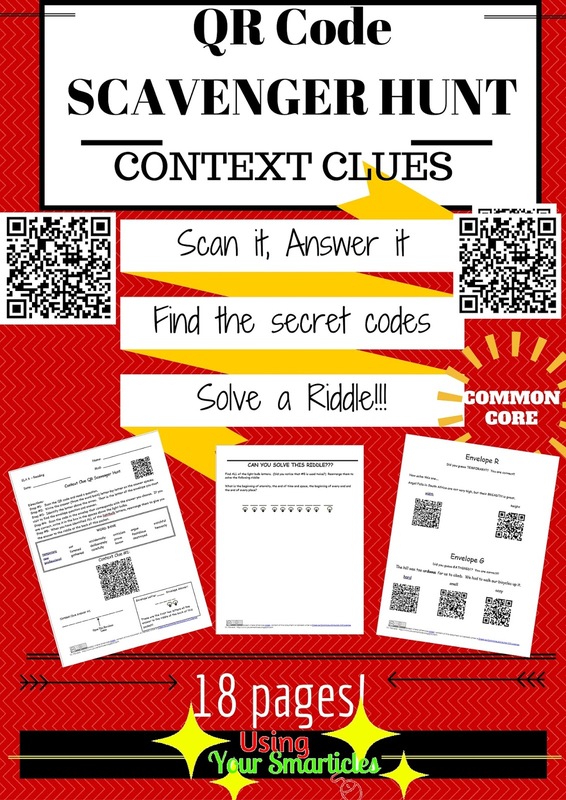 Gather the riddle answers and the students can solve the scavenger hunt! Looking for a GREAT way to celebrate Earth Day? Why not take technology outside??? This terrific QR Code Scavenger Hunt allows students to stretch their legs and explore the create outdoors with their digital devices. No wifi outside? No problem! 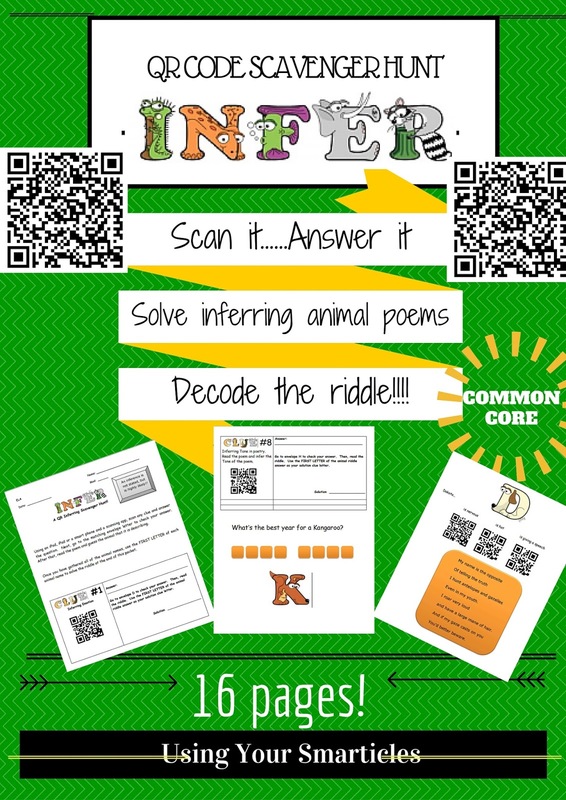 This QR scavenger hunt is designed to be used outside for Earth day without the need for internet access. In this scavenger hunt, students read Earth Day clues describing something critical to earth: worms, compost, seeds, glucose, chlorophyl,water etc. As they answer each question, the 'check' their answer by scanning a QR code. The QR code answer will then be the title of the next stop in their scavenger hunt. Go ahead, scatter the clues throughout the school grounds. It's a GREAT excuse to get outside and do something educational for Earth Day. 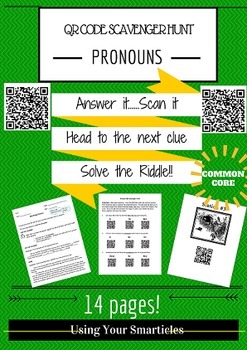 Have your students practice identifying pronouns while integrating technology! 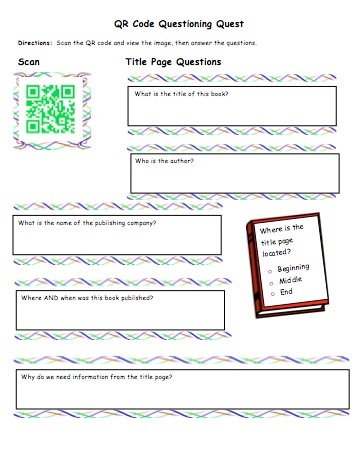 This QR Code Scavenger hunt is designed to be used with a Wifi enabled device with a QR code scanning app. The entire scavenger hunt corresponds with Rudyard Kipling's Rikki-Tikki-Tavi story. First, students are provided a worksheet on Pronouns and Antecedents and are given an opportunity to practice identifying pronouns within a passage from the story. Next, students are given sample sentences and are asked to recognize the pronoun that fits within the sentence. They check their answers by scanning the a QR Code. If they are correct, the QR code will lead them to a station image (an original image from Rudyard Kipling's Rikki-Tikki-Tavi. At that station, scanning the QR code provides them with a clue to a riddle. After collecting all of the clues, they can solve the riddle!! Once students get started, they will work cooperatively, independently and remain engaged!! A true plug-and-play lesson!! #9. 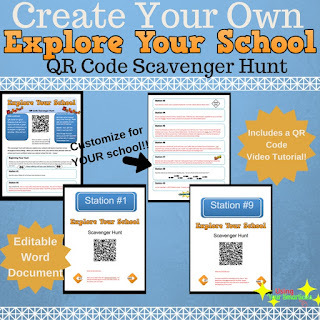 Explore Your School...EDITABLE Scavenger Hunt! This product is a template for you to follow to create your own 'Exploring Your School' Scavenger Hunt for Back to School or for students entering a new school. 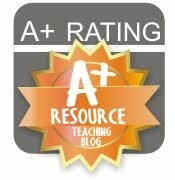 When you download this Word File, you will be able to edit it to customize it to your school. In this 'hunt' students are guided from one QR code to the next. Each code is placed next to an important feature of the school. The hunt serves to familiarize students with a new school (I used it for our Middle School). Can't choose? 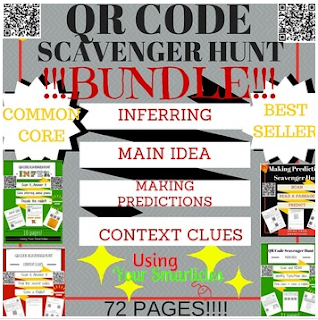 Try this BEST VALUE BUNDLE and get 72 pages of QR Code Scavenger Hunt Resources!!!! !